This dude was around a while ago, but with the increase of Big Data his theory around approximation becomes more and more important. 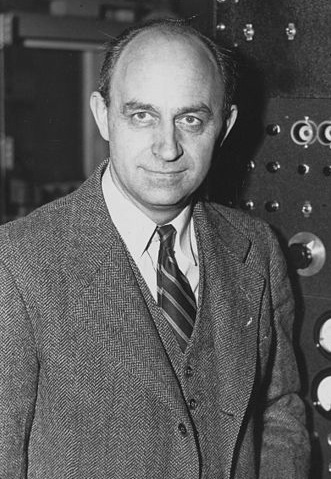 His name was Enrico Fermi, born in Italy in 1901, passing away in 1954. He did quite a lot within his lifetime but to me in what I do, his legacy of the ‘Fermi Problem’ is what I’ll remember him for. The Fermi Problem was most famously used in his University teachings in the US to challenge his students to estimate how many piano tuners there are in Chicago. A daunting task if you didn’t work with approximations. (50 weeks/year)×(5 days/week)×(8 hours/day)/(2 hours to tune a piano) = 1000 piano tunings per year per piano tuner. So basically the Fermi Method is to identify a series of assumptions, use these assumptions to obtain answers that seem impossible to calculate given the limited amount of information or data. I use this method a lot in calculating energy savings, predicting energy consumption and providing a better context of our choices for a more sustainable life – for example water savings from showers versus red meat. The disruption? Well, we are in real danger that Big Data will stall progress, deer in the headlights style. Don’t over think the data, break it down into base assumptions and calculate an accurate approximation – use the Fermi Method.